While spending a rather leisurely Saturday morning in the South End, I decided to stop by Gallery Kayafas and see my friend, Brian Urwin’s, new work. I can’t copy and paste the photographs from the Kayafas website, so follow the link here to see Brian Urwin’s work. As usual I was pleasantly surprised and delighted by the work shown even other than Brian’s. In the front gallery, they are showing the work of Robert Knight, who documents the act of sleeping in three to seven hour long exposures. 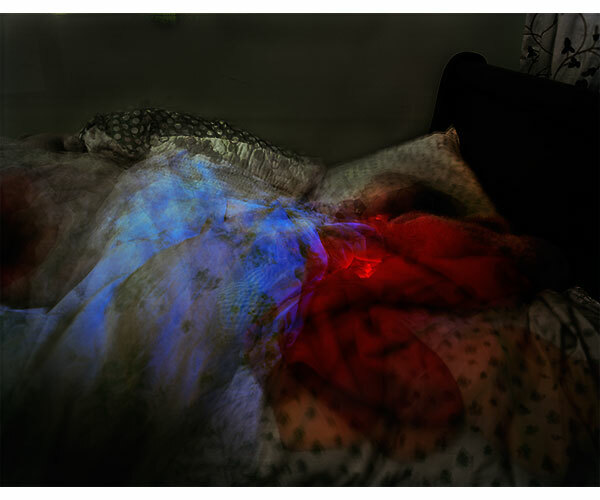 The large color photographs track the sleepers’ movements, creating ephemeral, ghost-like images. My favorite of these images is the photographs of his daughter sleeping. Cocooned beneath layers of blankets, the rise and falls of the sheets, the moonlight across her bed and a bright red night light tucked in next to her give the photograph and suitably dreamlike quality. The red light could almost be a symbol for her beating heart. The layering transparent images add a level of abstraction, forcing the viewer to really feel out the photograph before being able to even discern what is being shown. Compositionally, the photograph seems to be organized into layers of color that converge at different areas in the picture: the cold blue light of the moon at the bottom of the bed which is in direct opposition to the warm red of the night let, and then ensconced by the pale yellow of the little girl’s bedding. Finally, there is the little girl herself, a little brown mound barely peeking out from under her blankets. It is surprising in how refined and crafted the work can seem, even though it was completed mostly without the direct influence of the artist; it really manages to demonstrate his love for his daughter, something made all the more meaningful in the ‘organic’ method of creation. Robert Knight’s exhibition also includes an installation piece involving a large pillow where he projects a black and white movie of his head in bed, beginning before he goes to sleep and ending in the morning as he gets up. The film also includes a corresponding sound track and a day bed. Overall, the piece was well executed; as NAC mentioned, the choice to project the images onto a pillow brought a nice sense of realism to the piece. My favorite piece is “New York, 1997,” a photograph whose strength results from its timelessness. The photograph appears to be taken from a balcony high up from the city street. The photographer is facing down and slightly to his left, following the streaming light down a busy New York City street. The photograph seems to be responding an even earlier form of art and art history as the street disappears at the same point where the light emanates. From this, the image can be distilled to competing and converging lines: the strong white upwardly diagonal line of the street, punctuated by the lines of small black cars, and the contrasting subtly dark lines of the rising buildings. Even more subdued are the thin horizontal lines of the street lamps and the cross walks, providing consistent visual interest. The entire piece exemplifies the power of photography’s roots. There doesn’t need to be innovation in the method, it is a beautiful, strong, moving, black and white photograph. Finally, Brian Urwin’s work centers around the slowly disintegrating city of Detroit. Speaking with him, he explained that he uses a wide view camera (see below) which means that each image was not a one-off shot, but that he had to consider what he was photographing before setting up his camera. The result are images whose graph-like setup belie the erosion the city. My favorite example of this is “Fisher Building, Detroit,” a massive art deco building that seems grand and triumphant but lonely, with no sign of population. The photograph itself is quite large, maybe 3×4 ft, encompassing the vision of the viewer. The print is mostly silvery grays that highlight the strong verticals of the building’s architecture while the horizontal lines are enhanced both through the width of the photograph itself and the fact that the building stretches from edge to edge. The grid of the industrial structure is broken by certain touches, most noticeably the fading black corners, indicative of the wide view camera, which both adds an antique feel to the photograph, capturing a sense of the by-gone, while also disrupting the rigid geometry. Finally, the lack of people creates a sad tint to the image. Such a large and beautiful building should be highly populated, both inside and on the street. Instead, the lack of humanity makes the image feel like something almost post-apocalyptic (or maybe I’ve just been playing too much Left for Dead…).